This group provides support to fellow professional job seekers in the Fort Worth area of the metroplex. We exchange job leads, network, offer useful strategies for a job search, share information on job search workshops, and provide support and encouragement to each other. You are not alone. We are here to help you! Feel free to recommend us to others! To join this group, one should attend our Monday morning meetings. The Fort Worth Career Search Network (FWCSN) group meets every Monday at 9:00 a.m., except Memorial Day, Labor Day and the Monday between Christmas Day and New Years Day. We suggest you arrive at 8:30 a.m. to register and to start networking with our members! 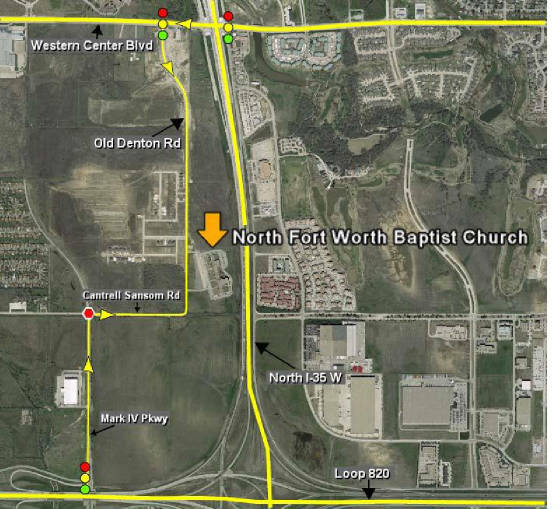 The Entrance for North Fort Worth Baptist Church is on the Right. The Entrance for North Fort Worth Baptist Church is on the Left.